Often when making modifications to a palette partway through a project I’ll want to copy a palette entry’s RGB or HSV over to another entry: either to make a color very similar to it, or to make distinct groups of bindings with the same color such as for color cycling. 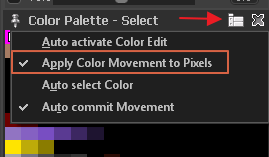 However, often when using the copy paste in the palette modification tab, all the current pixels using the old color entry will bind to the new entry I just pasted into. So for example I have a gradient of 8 colors for color cycling and copy one of the color entries and paste it somewhere else in the palette; now all the pixels for that color entry won’t cycle because they are bound to the new entry, and when I change the new entry RGB or HSV it changes all the pixels ripped out of the color cycle! Is there a way to avoid this and only copy over the RGB or HSV, without changing the palette entry bindings of current pixels in the image?